For two days in the dust, dirt and heat we shake our heads and laugh as the local Bedouins eek out their living. We clamber to the side of the Siq a long natural gorge that leads eerily into the ancient city of Petra, as the horse drawn vehicles crazily slide through the narrow gorge struggling to stay upright on the slippery age old surface. 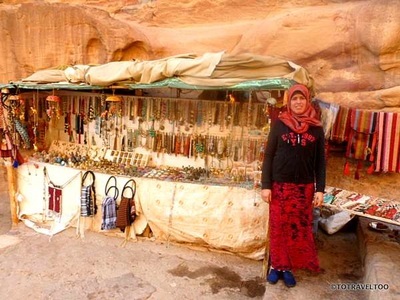 We are in Petra, Jordan, nowhere else in our travels have we come across a sight such as this. Monuments, some over 130 feet tall, carved into the red stone rock formations of the area. Jordan’s famous UNESCO World Heritage Site commands a high position on a plateau in the Valley of Moses in the south west of the country. 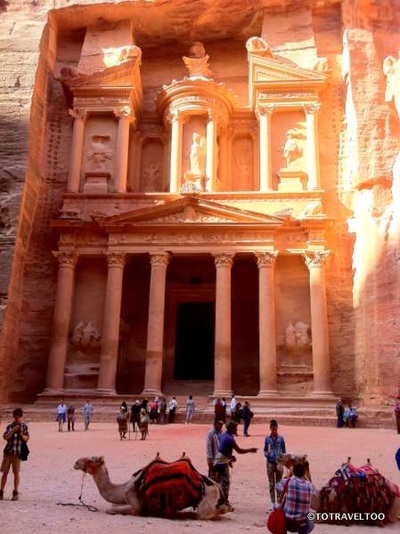 Petra made it on the international movie scene when Indiana Jones in the Last Crusade used the Treasury as a back drop for the secret temple that had been lost to the world for over hundreds of years. It is well named, as Petra is derived from the Greek word Petros meaning stone or rock. We thought we could visit Petra in one day, what were we thinking - this site covers 60 square kilometres! We spent the previous night in a Bedouin Tent at the Seven Wonders Bedouin Camp and after chatting with the owner and other travellers we extended our stay for another day, but this was still not long enough. 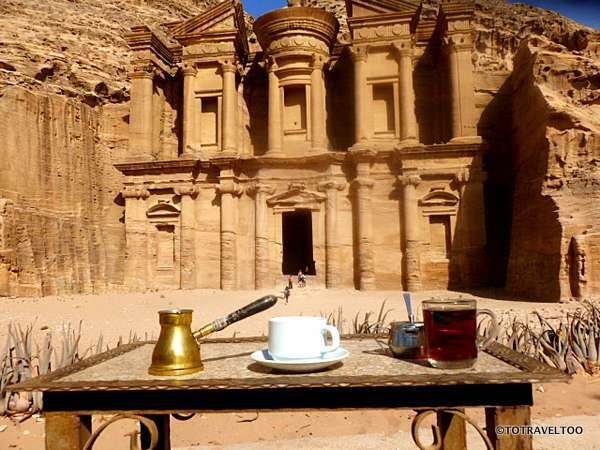 Don’t rush Petra, plan it carefully and also include the Petra at Night experience, which we didn’t have time for. The longer you are in Petra the cheaper the entrance fees. You will need at least two days, a good pair of walking shoes, a hat and plenty of water. There are stalls that sell water and food inside but at a price, of course. There are many trails to explore and steps to climb. Petra has a fascinating history, a thriving trading centre for the Nabataeans, located between the Dead Sea and the Red Sea. They traded in spices from India, textiles from China, perfumes and incense from Arabia. They became wealthy from taxing the many caravans that plied the desert route. 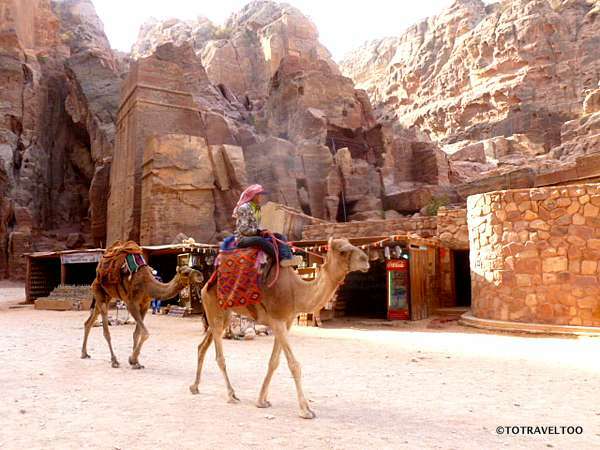 The Nabateans were skillful at controlling the flash flooding through the mountain chasm by building dams, cisterns and water conduits and storing the water for sale in times of drought. Petra came under Roman Rule in 106AD, sadly this was the start of its demise coupled with two major earthquakes in 363 AD and 551AD that destroyed most of the city and its water storage systems. 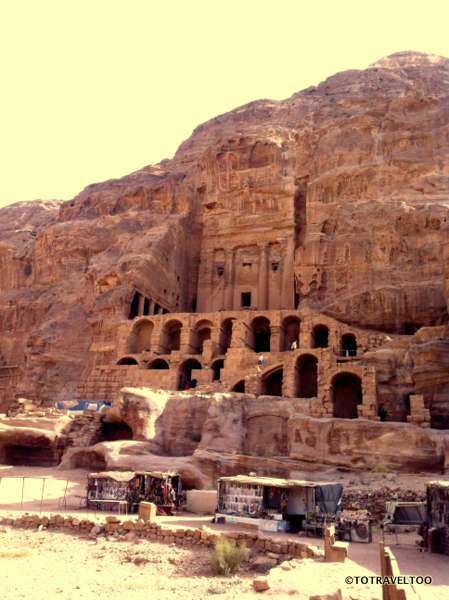 The Romans reintroduced the major sea routes, which crippled the overland trading routes, and its citizens abandoned Petra and only the local Bedouins remained. Standing 40m tall this imposing structure greets you as you exit the Siq (a narrow gorge of 1.2 kilometers which is the main entrance to Petra), it is well preserved as it has been protected from the wind and rain for centuries. Time your visit when the sun strikes the façade directly giving the building its pinkish hue at between 9am to 11am in the morning and in the afternoon between 5 and 6pm. Tackle the 800 steps to the Monastery in the afternoon where you can take advantage of the shade. 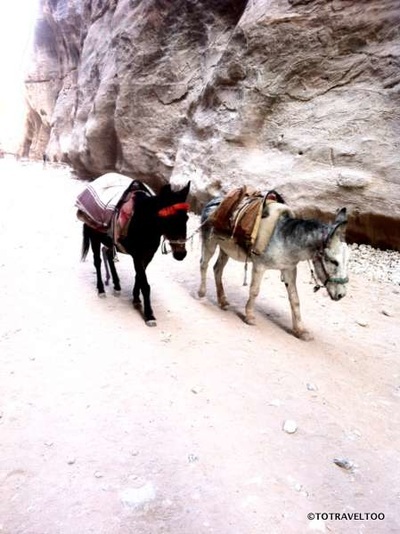 Donkeys are available to carry you up the steps, remember to bargain with the Bedouins but beware they set their own pace and at times can slip and slide on the well worn path. Our tip is to take this slowly, rest along the way, chat with the Bedouin ladies selling their jewelry or have a cup of refreshing mint tea, and keep out of the way of the donkey’s path. Your reward is the view at the top. Opposite the Monastery is a small café, why not order a refreshing mint tea and enjoy the vista of this incredible structure. Your legs will also thank you for it. The Monastery is tall at least 50m high where the doorway itself is larger than a single storey home. Originally it may have been used as a Temple, but archaeologists are still not quite sure. Petra is one of the unusual destinations to visit, take your time, read up on the history before you arrive and you will have an awesome experience!